WILMINGTON, Del., Dec. 12, 2017 /PRNewswire/ -- Every night, before going to bed, Gabrielle Jordan was told by her parents that she needed to "be a leader, not a follower." So, from a very young age, Gabrielle knew that she held the keys to her future. What her parents did changed her life and now, she delivers that same advice to students all across the country. Rob Siegfried, the CEO and Founder of The Siegfried Group, poses with students following a Siegfried Youth Leadership Program event at the University of Delaware. Gabrielle Jordan speaks to students at Siegfried Youth Leadership Program event at the University of Delaware. Rob Siegfried, the CEO and Founder of The Siegfried Group, speaks with a panel of students at Siegfried Youth Leadership Program event. For many students, being a leader isn't their number one priority. Although a few leadership qualities can come naturally, many children and young adults will rely on the people in their lives and their experiences to help them develop important leadership qualities. The earlier they learn how to identify, hone, and use these qualities, the better. "My goal for this program is to help transform the lives of the youth in our community," said Siegfried. "I'm trying to help people, including myself, be more transformational so they can get more out of their lives. For students, coming here and being able to hear different perspectives in a new environment can be very powerful and can help them commit to reaching further and thinking bigger. I really believe that doing this type of outreach now, while they're still young, will make a huge difference in the long run." The Siegfried Group, LLP (Siegfried) works alongside financial executives across the nation, on their most important accounting and finance projects. 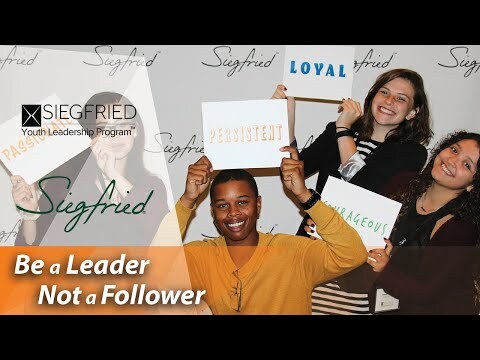 Filled with an innovative spirit and led by an ambitious entrepreneur, Siegfried provides unique Leadership Advisory combined with high potential talent. At the heart of our Firm is our approach to individual leadership and the continual pursuit of helping people grow both personally and professionally. As a whole, we value having fun, being fair, and building and sharing stakeholder value.